As I was browsing Amazon for therapy materials over the summer, I came across the most amazing thing: blank playing cards! As soon as I saw them, the wheels in my head started turning to come up with ways on how to use them in Speech. I tried out three different variations of blank playing cards made by Apostrophe Games: Rectangular , Square , and Dry Erase . Blank playing cards are available in these three options: rectangular, square, and dry erase. If you’re like me, you are probably tired of using the same old artic decks over and over in your sessions. To combat the monotony, my students and I decided to use these cards to make our very own articulation decks! At first I thought that we could use index cards. However, the quality of these blank playing cards is SO MUCH BETTER and definitely worth the extra money.They are about 2-3 times as thick as index cards and marker / Sharpie does not bleed or seep through to the other side. Since you will likely end up using the finished cards with your students in therapy sessions, it makes sense to want them to be durable. They are so thick that you could even skip laminating - seriously, who has time for that? I started by having my groups come up with words containing their target sounds. This was great for stimulating their awareness of their sound. As they were rattling off words, I wrote them onto the playing cards with a Sharpie, making sure to highlight target sounds in red. Of course you could have students write the words themselves, but I wanted to make sure the writing was nice and big and didn't have spelling errors. To make this more engaging, I allowed students to include Pokemon and Minecraft things (Hey kid, if you want to practice the word "creeper", which has two /r/ sounds, be my guest!). Next, students drew pictures of their words onto the card (we used washable markers for this), although pencils or crayons would work as well. While we worked, we also practiced saying the words we were drawing. Students were super motivated throughout their session. And look how awesome their cards turned out! I used both Square and Rectangular cards for this activity and didn't really have a preference. The square ones seemed to be big enough for a picture, and also might be better for little hands. This would also make an excellent homework activity: send home ten blank cards with the words on it and have students draw and practice at home. You could also let students keep their cards at home for practice. And of course you could adapt this activity for language groups - you can make homonym/homophone cards, opposite cards, WH-question cards, and so much more! 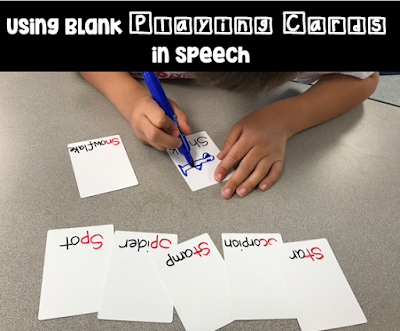 I also found a use for the Dry Erase Cards - I used them for a listening activity with my language groups. Because these cards are double sided, they lend themselves well to alternate response mode activities. I drew a happy face on one side and a sad face on the other. Each student in the group received one of these dual-sided cards. Then they had to listen to conditional statements (e.g. "If you have brown hair, hold up your happy face") and follow the directions. This was great for working on following directions and general listening skills. A note: To prevent smearing on these cards, you may want to consider Vis-A-Vis Markers .What is really nice about the dry erase deck is that it can be reused over and over. This is a therapy activity I will definitely keep doing again and again as I cycle through new students. I'm so glad I found these cards! !